Due to a change of plan with going to the Ritz, we were combining 2 and 20; Jordan had given us a Christmas present for the Cookery School in London to do a Cookery course. 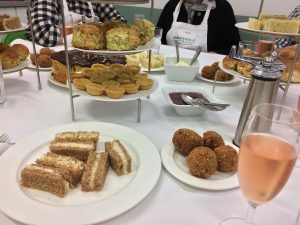 We picked an afternoon tea course so we were going to be shown how to make and also participate in making tea plus eat it afterwards. With the show, we put the pressure on Jordan; Kathryn and I gave Jordan the name of 2 shows that we wanted to see and got him to pick one and organise the tickets for us. When we set off, we didn’t know each other’s choices and just had an envelope with tickets in and instructions to get us to the theatre. At the coach station, we told each other the choices. On the coach we opened the envelope. Jordan had chosen Stepping Out with Amanda Holden starring. By the end of Saturday, I remembered nothing. Oh well, another challenge on the way. We had lots of time before the course started so instead of taking the tube, we decided to walk. Walking instructions are easy to find when you have a mobile phone; following the starting instructions are another matter. No idea what go north on this road means. Needless to say, a few wrong directions but we did find our destination. 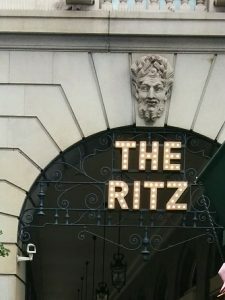 On the way, we did pass the Ritz. We are going to have tea there one day. We needed food. 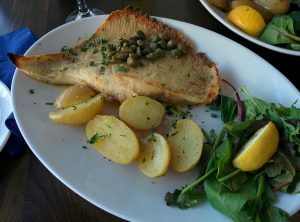 I spotted a Slug and Lettuce and decided that would be a good place to go. One of my things now I am 50 is to try to avoid the chains but Slug and Lettuce does give you reasonably priced food and a variety of choices. 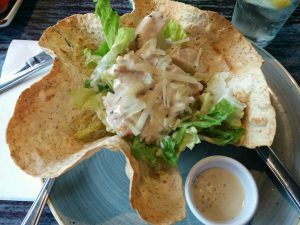 I went semi healthy and chose a chicken Caesar salad in a tortilla bowl. I wasn’t expecting this but it was nice. It was then time to get wet. My weather app hasn’t been too helpful recently but it had said rain in London between 12 and 2 so I was prepared. Gave us an excuse to pop into some shops. Then we headed to Little Portland Street for our course. We were both a bit nervous about this. There were eight of us altogether and the other people were very nice. We had a glass of wine at the start; probably not a good thing for me. Course started promptly at 2 p.m. and we were shown how to make a sweet pastry which we were going to be using for small lemon tarts. Then we were shown how to make bread and how to prove it. 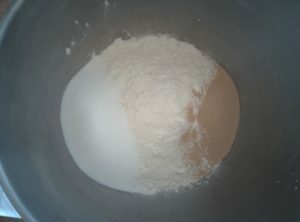 Some mixture had already been made to use for some rolls. This was our first job; we were expected to roll into rolls. Now something you should know is I hated home economics at school. 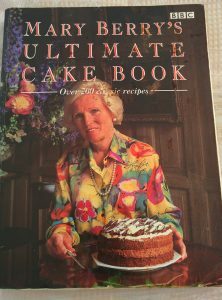 I was never going to be a cook and I was happy to give up the subject. 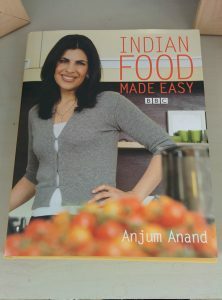 Ironic that as soon as I had my own kitchen and, with the aid of cookery books, I began to enjoy cooking. 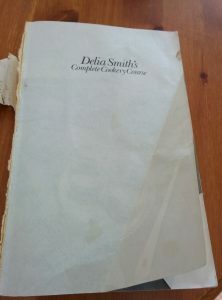 Memories of my dread at school came back and whilst I would never shine in this cookery course, I certainly know I had the skill to pull off some, if not all of the recipes. Some would need practice but in Tina’s way, I will do them. 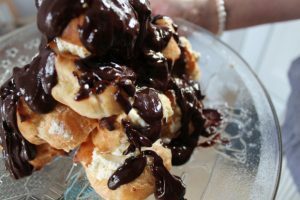 We were soon filling pastry cases, watching lemon curd and jam being made, getting tips on how to make a ganache (I will be trying this), preparing scotch eggs, slicing and buttering bread (really do you need all that butter) and watching scones being made. It was soon time to eat what had been prepared. With a glass of sparkling wine, we sat down and toasted to our tea. It was all yummy and the cucumber in the sandwiches which had been salted and allowed to drain with a saucer on top, was very good. 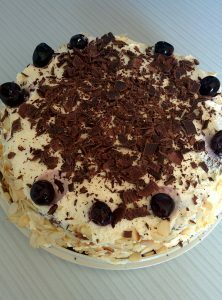 The rather delicious cake with cream in the middle and ganache on top but it was a little too much after all the other delights. All in all, the course was very good and I came away with some good tips but I am not sure if I would take part in another course like this. 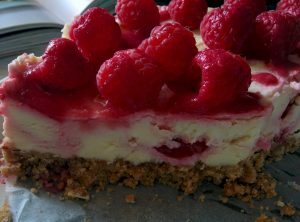 I alway follow recipe instructions but do like to have the freedom to make my own mistakes and learn about them in my own. The streets of London were very crowded and Jordan’s detailed instructions to get us to the theatre had to be abandoned due to the station being closed. We thought we would walk there. Once again, directions proved a little difficult to decipher and it probably took us longer to get there. The show was at the Vauderville theatre situated in the Strand. On presenting our tickets, we were told to see one of the other ladies who would reseat us. I had given Jordan a budget for our seats and we should have been seated in the upper circle. We were changed to stalls and had a great position. Feeling very good for the change certainly encouraged me to buy a programme for my 50th box. 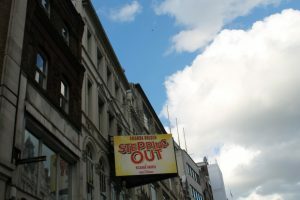 Stepping Out isn’t one of the singing musicals we normally go for but more a comedy with characters who had sad stories to tell but with a very good feel ending. It was written by Richard Harris as a play and later into a film with Liza Minnelli playing a former Broadway dancer. Mavis now teaching a weekly tap dancer to a group of women and one man who have different personal issues but enjoy their one night trying to learn to tap. Mavis hears about a competition and decides to enter the group in it. I don’t think I have seen the film but it has always been highly recommended by Lana, our Zumba teacher. Amanda Holden, who plays Vera in the production we saw, actually saw the film and decided she would love to act in a theatre production with some of her acting friends. I was intrigued by the play and I managed to escape to my own little world watching it. It was a play which I laughed so much at but cried too with the pain each character went through. The cast was fantastic and played each character so well. It was easy to miss something going on in the background. The first half is short. The final half longer and leads you up to the finale which you are expecting. There are so many shows in the West End that it is hard to pick one to go to. That’s why we gave the choice to Jordan. The theatre wasn’t full which is why we probably had a change of seats but I really enjoyed the show and am pleased that we went to see something different. 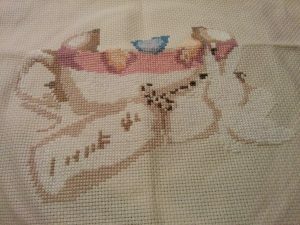 On starting this post,2 Kathryn has told me that I am not allowed a tick for challenge 20 which disappointed me. With only 12 days left, I don’t think I’ve enough time to fit a different course in. Oh well, guess 2 out of 3 isn’t bad and going to have to get ready for not getting 50 ticks! We did have a lovely day in London. 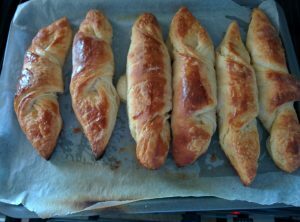 Challenge 30 – Make croissants. Now did I want to make croissants? I can say after reading the recipe from Paul Hollywood’s How To Bake, I really didn’t want to make croissants. I was so frightened about this challenge and I kept putting it off. First of all, about Paul Hollywood. 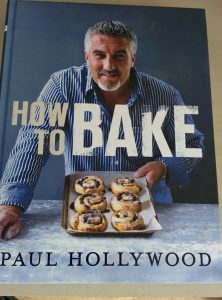 When I first saw Paul Hollywood on Great British Bake Off, he came over like a Simon Cowell type judge of the baking world; the villain you want to hiss at like you would in the pantomime. Just like Simon Cowell, he is the bad boy you can’t help liking and all contestants want to impress. Jordan has bought me two of his books, the one I was using for the croissants and British Baking. 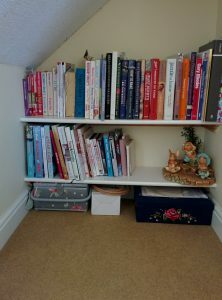 I have used British Baking more but both books do have a good layout; the croissant recipe explains what ingredients to use and there is a step-by-step photograph section. Easy stuff!! First part of the recipe is easy enough. 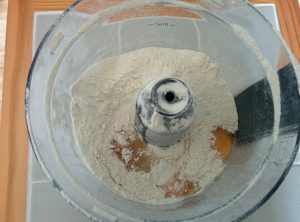 The good old food processor was used and the instructions are very clear for this. 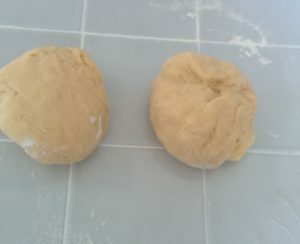 The first part of the dough was made easily. Croissants take a long time to do because there is a lot of chilling to do; the dough needed to go in the fridge for an hour. Next part didn’t seem too difficult but I didn’t achieve what Paul was asking. The butter has to be chilled and you have to bash it with a rolling pin. I did not have the skills for this at all. 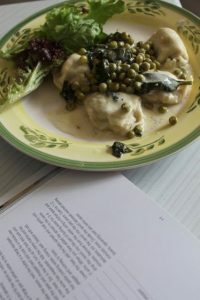 Not to be put off, I consulted other books; my favourites let me down and didn’t have any recipes but the food processor book did. It said to dot the with butter. I took that method but folded as Paul’s recipe. 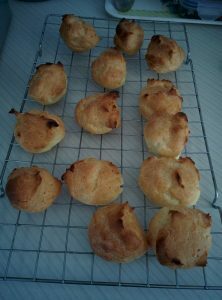 I was not convinced and, at this stage, I thought I was doing this recipe for a tick and would never make croissants ever again. The shop over the road sold them so why should I! I put the dough back in the fridge for another hour. 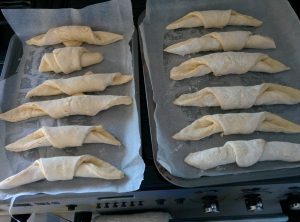 I had to roll out and fold into three, three more times chilling for an hour in-between each folding; the dough, not me! I was at this stage thinking are these ever going to be edible. 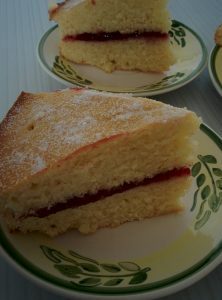 To make up for the likelihood of them failing, I baked a Victoria sponge just to prove I could bake! 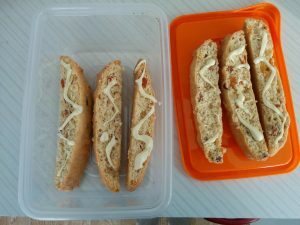 After the last roll out and fold, the dough had to be put back in the fridge overnight. Despite my changing the method a little, I did actually think that it did look like Paul’s photo so was hoping it would turn out okay. That didn’t stop me waking up at 6.15 a.m. and rushing down the stairs to check I had added the yeast correctly at stage 1. Huge relief when I found I had. 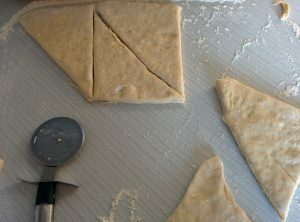 The final process of making the croissants needed to be done; rolling the dough to a particular size, cutting the pastry into 12 triangles and then rolling up into a croissant. I had convinced myself this would be hard but it was much easier. Had to leave to rise for 2 hours before baking. By 9.50 a.m. we had croissants which, surprise, surprise, looked like croissants and tasted like them too! I ask myself the question again; voulez-vous faire des croissants? The answer is yes I will make you croissants. Would you like normal, almond or pain au chocolat? 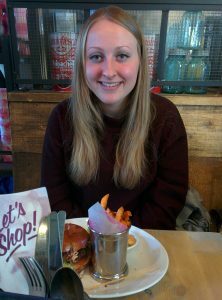 Challenge no 16 – Day trip to Cardiff to visit daughter, go to Cardiff Bay for lunch and buy Welsh cakes. 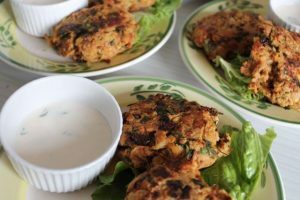 Any journey or trip with the family will involve planning around eating. 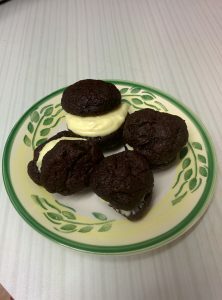 We are particularly fond of cake especially cream teas. 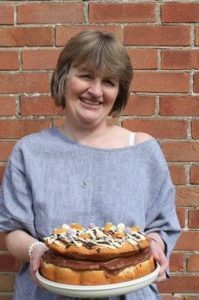 As I was visiting Kathryn at her 2nd home, I thought I would make her a cake. She has insisted that I only take a few slices up as she is eating healthily. I am sure the boys won’t mind be left with the remainder. 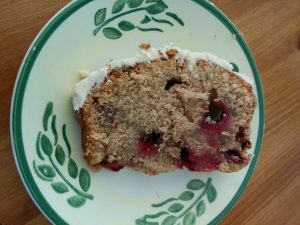 As I was going to Wales, I opted for Paul Hollywood’s version of the Welsh plate cake, white chocolate and cherry cake. I think it went down very well. 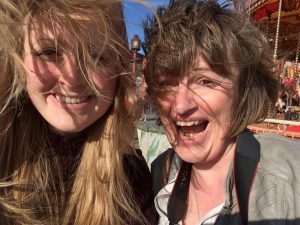 My trip was taking place on Saturday 25th March, the day before Mother’s day and I was looking forward to having a lovely day with Kathryn. 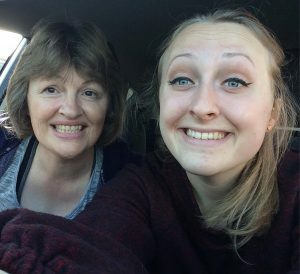 After a three hour train journey, I was able to see my daughter and experience, in unusual March warm weather, a walk in Kathryn’s favourite parks. One of the parks gave me an excuse to use Kathryn’s camera, a very thoughtful present from Aaron. I want one; I meant the camera but Aaron is a lovely lad too! With the camera, I was able to capture an arty picture for challenge 26. I will share later. 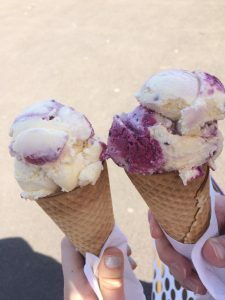 After having a delicious blackcurrant and clotted cream ice-cream (another family favourite), we reluctantly left Roath Park and the many families enjoying the sun, swans and beautiful scenery, and made our way to catch the train. As much as she is clever, my beautiful daughter can be a bit dipsy too; she honestly thought that the restaurants and pubs would stop serving food at 3 p.m. I personally think she was just hungry and wanted me to walk a bit faster. Cardiff Bay isn’t too far away from the City so it didn’t take long before we were sitting down enjoying a lovely lunch. There is certainly a great selection of places to eat. We opted for Bill’s and loved the look of everything on the menu. 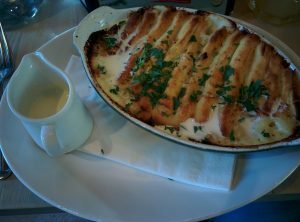 I opted for a fish pie and Kathryn decided to go for a burger. 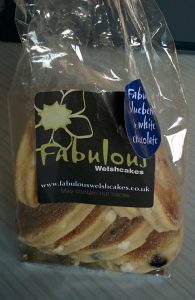 Although we were very full, we still needed to buy the welsh cakes. For these we went to Fabulous bakery on the quay and chose blueberry and white chocolate. We didn’t actually try them until on the train back to the City; they were yummy. We took in the scenery and enjoyed a walk along the quay. Kathryn was trying her hardest to try to get a good “selfie” of us but the bright sun and wind had other ideas for that. 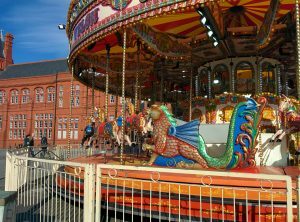 Another photo we both wanted was the carousel; on our first trip to Cardiff Bay when we were viewing the university, we watched with amusement, a wedding party enjoying this carousel. What great memories for the start of your marriage. We even got to enjoy a female choir singing The Climb (apparently from Hannah Montana, information courtesy of Kathryn). We still had a few hours left so we returned to the City and I managed another challenge; buy a physical copy of an album. This had rules and had to be spontaneous so I was not allowed to buy The Osmonds because I had wanted that one. Honestly, I would not have thought about that had I not heard Let Me in on Radio 2 a few weeks ago. What can I say, the kids today would definitely love that music. In the end, I decided to by Eva Cassidy and I can confirm I love it; with a song on it called Kathy’s Song, I would say it was the perfect choice. I was then taken towards the car park in St David’s shopping centre to play adventure golf. There are 2 courses; we chose to play the Ancient explorer trail and Kathryn joked that it would be funny if one of us got a hole in one at the end and got a free play. Funny as it sounded and I’d like to pretend beginner’s luck but we have both been rubbish at crazy golf for years, we both did get a hole in one and Kathryn has 2 free games to play in the next couple of months. Thanks Bob, we did beat the 19th. I must add that Kathryn did win our game. With sadness, I said goodbye to Kathryn (I will probably see her at the end of the week! ), and made my way home. 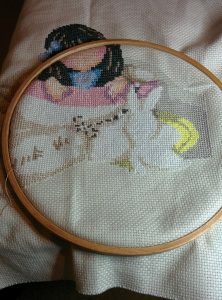 This challenge was a joy and I am looking forward to my next day out with my (I know this is getting boring now!) beautiful daughter. Three ticks for this adventure. My weekends have certainly been taken up by challenges just recently and I have got just under 7 weeks to finish. Very busy weekends. Preparation is going very well. 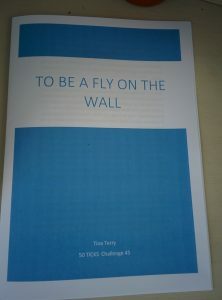 The challenge I completed at the weekend certainly goes into the top 10 of my favourite challenges. Believe it or not, I found it fun, a little challenging and rewarding too. 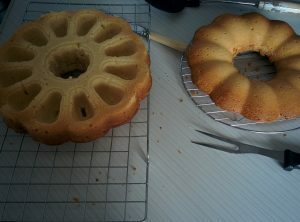 There were 2 challenges here; buy a new baking machine and make something with the baking machine. Also have to document it in my scrapbook. 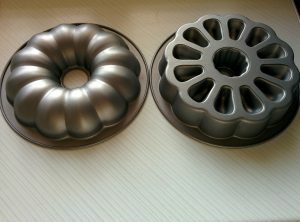 I had been searching for the right “baking” machine for a while. 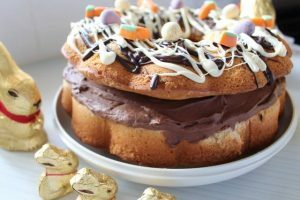 It didn’t have to be baking like a bread machine or doughnut maker; it could be something like a soup maker which I did think about. Looking at my blender attachment for my food processor, I decided against that. I did also think an attachment for the food processor would be a good idea; I really want the mincer attachment. I could make great chicken burgers. 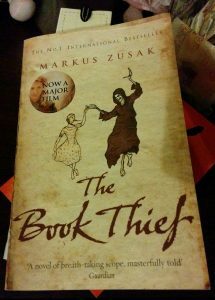 In the end, a book helped me with my decision. 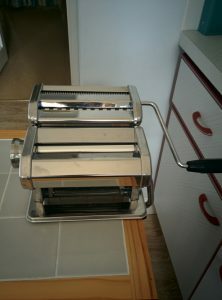 I was reading From Rome With Love, when it gave me the idea for a pasta maker (also an idea for this month’s book to read with a different genre too so a worthwhile read!). I investigated the different sorts, a manual machine and an attachment for the food processor. I ruled out the attachment out due to cost and after reading the reviews, went for this little beauty from Marks and Spencers. I decided to use it when everyone would be home and after looking at the many recipe books we own (I was delighted to read in Mike Gayle’s The To Do List that he has cookbooks to that he hasn’t used), with Chris’s input, I decided to make a carbonara recipe from one of Gary Rhodes book. 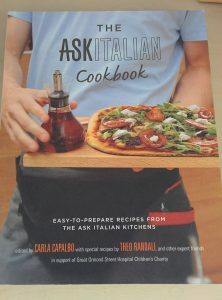 For the pasta recipe, I used different books to find the the best method and ingredients. 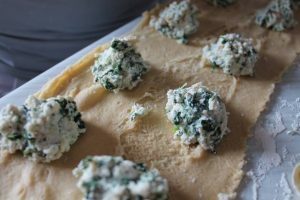 All you need for the pasta dough is flour and eggs. The flour needs to be 00 flour (I didn’t have a clue either) and some need semolina flour too. In the end, I opted for Tesco pasta flour and it worked a treat. 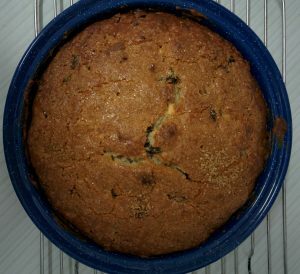 It even has a recipe on the side. 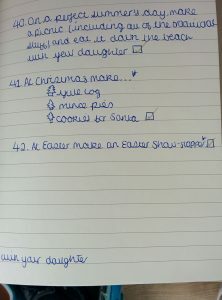 I was a little surprised to see that I was expected to sift the flour on the worktop and make a well to add the eggs. I decided on a less messy approach; my good old food processor. Such an easy method. Whilst I rested the dough, I assembled the machine. The only fault with it was the clamp did not fit my worktop but that didn’t beat me; I had a new vegetable rack with worktop that fitted the job perfectly. 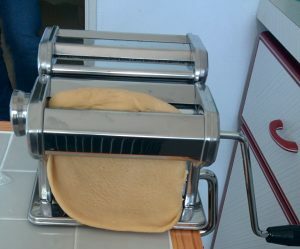 When the pasta dough was ready, I had to feed it through the flat rollers which according to The Ask Italian book, proves the dough, and the gluten’s in the flour will be kneaded and elastic. It needed to go through this part several times. It was amazing when I looked at the photograph in the book to find that mine looked the same. Next job was cutting the dough. 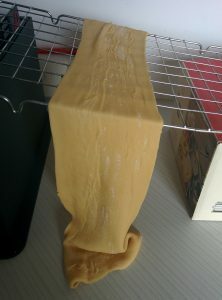 It did make me so happy watching the machine cut the dough into tagliatelle. 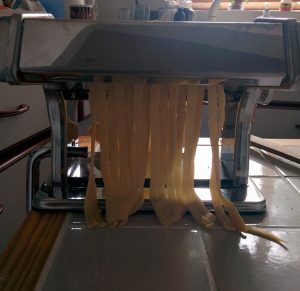 I concocted a rack to dry the pasta on for two hours before making the carbonara. The pasta does not take long to cook so dinner was made very quickly. 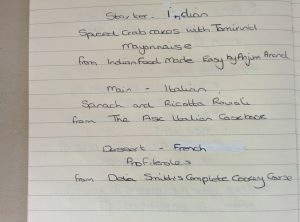 End result was fantastic; my description would be a creamy Italian version of an English cooked breakfast. Delicious. 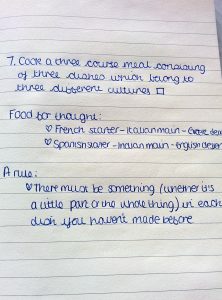 I loved this challenge and although it won’t be used every week, I am determined to use it regularly. 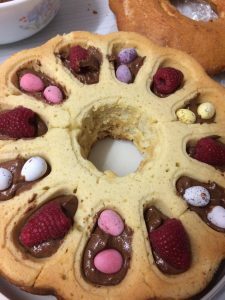 Might even attempt the manual method of making the dough next time. Two big ticks earned here.